Every day this week the boys have returned home from Summer Day Camp with a new and exciting craft. 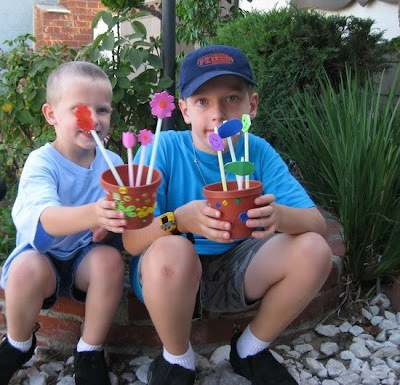 Monday it was globes-on-a-stick, Tuesday it was race car sun catchers, today it was pots with bendy-straw foam flowers. But what, you ask, is holding those straws in the pot? I'll tell you... it's modeling clay. The boys didn't even say hi to us when we picked them up, they just asked in unison if they could dismantle the lovely flower pot craft so they could get to the clay and build something. Of course I said yes, but forced them into a photograph before the destruction of flowers began.